My exclusive interview with Lili Bosse, Mayor of Beverly Hills. Nathalie Virem: Why did you decide health and wellness were important initiatives for the city of Beverly Hills? Lili Bosse: My initiative as a Mayor is that Beverly Hills be a healthy city: healthy people, healthy economy, and healthy government. What I really believe is if we’re healthy on the inside, then everything else falls into place. That’s true as individuals and it’s true as a city. So I felt that we as a community could bond on that issue — that we can really thrive, if we look into what it is as individuals, that will make us feel healthy on the inside. Nathalie Virem: What are some of the steps you have taken to make your vision happen? Lili Bosse: I do something every Monday called ‘’Walk With the Mayor” — we meet in front of City Hall — every single Monday except holidays. I have between 200 and 400 people who walk with me in the city, we walk together. It creates a sense of community and a sense of connectedness, which I think is also part of health. Studies have shown that if you have connections, if you have relationships, you feel better and live longer; your sleep is better; everything about you is better. So even as a community, we walk together. It also shows healthy government because I’m not a Mayor who only wants to meet with people behind closed doors at City Hall. Everybody knows Monday morning you could be out front of City Hall and I’m going to be there, so government is coming out to the people — and that’s also part of what makes health. Nathalie Virem: Do you think there’s an awakening of health and wellness in today’s society in recent years, and specifically in Beverly Hills? Lili Bosse: Absolutely! Ever since I was Mayor in 2014, my initiative was a healthy city. The reason why I chose it then was because at that time, it was Beverly Hills 100th birthday. When people have a birthday or celebrate something special, they think about their lives — where they are at that time and where they want to go in the future. So for our city, I thought the same thing. Now, we as a society are doing that, we are now a little bit more into ourselves. We’re taking responsibility not only for who we are on the planet, but who we are to each other. Nathalie Virem: When we think of Beverly Hills, glamour and opulence are some of the first words that come to mind. By focusing on health and wellness, is it safe to say you are somewhat re-branding the city? Lili Bosse: My initiative for this entire year was: We are really going to focus on being the healthiest city in the world, and the elements of that are our souls, hearts and instincts. We now have something called “S.O.U.L. Sessions”, which stands for Seek Original Unique Learning. Beverly Hills is a world-famous city, everybody knows of us. I want us to be leading, be different, and hopefully inspire other cities and other Mayors to do the same thing. Nathalie Virem: What are some of the benefits the S.O.U.L. Program brings to the community? Lili Bosse: I think we all want to learn and we all want to grow. The benefit is having a program where we’re willing to seek and be unique and grow within ourselves and as a community. Everything that we do, whether dealing in business, interpersonal relationships, or government, we’re dealing with it with a sense of openness. That’s perfect because when you start with knowing you want to get something accomplished and do it in a positive way, it really gives a sense of excitement to all kinds of wonderful possibilities. Nathalie Virem: Have you collaborated with any public figures to further raise awareness on a local and national level? Lili Bosse: Fortunately, we have partnered with Deepak Chopra. Who else knows wellness better than him? We did something that has never been done before, a meditation in front of City Hall. Deepak Chopra led over a thousand people sitting and meditating together. Through this partnership, we’re going to bring all different types of unique learning: from meditation, to nutrition, to learning how to sleep better and do yoga. There are all kinds of unique ways that we as a community can thrive from the inside out. Nathalie Virem: What about on a global scale? Lili Bosse: Deepak’s goal is that other Mayors and other cities will embrace the idea that Wellness is in priority. I actually spoke at the U.S. Conference of Mayors at the end of June about our partnership with a Healthy City. What he and I envision going forward is other cities throughout the United States will have other Mayors and communities get out, walk and meditate together, spend time really thinking about what their passion is and what is really true to themselves. Basically, if communities around the world start to embrace true wellness and what matters to them, then I think slowly, one by one, we’re going to be changing the United States and the world to really be a thriving community. Nathalie Virem: How was your encounter with Deepak Chopra? Lili Bosse: When Deepak and I met it was truly synchronicity — those were his words, meant to be. We were two kindred spirits, which is so wonderful and rare because I think people don’t expect elected officials to be open to talk about S.O.U.L., and that’s what makes it so unique. He and I saw a chance to really change government, a chance to change cities. Nathalie Virem: Can you explain how Dr. Deepak Chopra’s new platform “Jiyo”, further helps your initiatives? Lili Bosse: Jiyo is a platform that will allow Beverly Hills residents to do yoga, track their sleep, and eating habits. After a year, we will be able to look back and see how we have changed and shifted. So I truly believe that it’s the beginning — Beverly Hills and Deepak Chopra are starting this together. This is something that other communities will embrace, and then slowly we’re going to see a shift in having Wellness be a top priority for every community in the United States and the world. Nathalie Virem: What role does meditation play in your lifestyle? Lili Bosse: I have now been meditating every day for about five months. In the past, I tried it and like most people said, “Oh this is too hard. I have a million things going on in my mind.” But I started small, a mini-moment, which is two minutes of your time. Even after two minutes I felt refreshed and ready for my day, and it’s grown. Now, I do a minimum of 10 minutes before I start my day. I wake up in the morning and before I get out of bed, I take 10 minutes of just pure relaxation to center and quiet my mind, as well open myself up to possibilities. It’s a very optimistic way to begin your day. In meditation, I think one can help with a focus on gratitude- I always say, “Every day, there’s something to be grateful for.” When you start your day with that mindset, how you approach everybody, and how you approach everything is a sense of being open to possibilities. Nathalie Virem: What is your mantra and how do you apply it daily? Lili Bosse: My motto is, “Start with yes and then figure out how.” Everybody knows that, so anybody who comes to me staff or resident knows I’m going to welcome them with a “Yes,” whatever it is. Then, we figure out how. So I think with the sense of having an open heart, having an open way of being is when you are ready start. Whatever the issue that comes before us, you start with saying, “We can solve this. We can do this!” It’s always a yes, and I think people who are responding are walking into the meeting; they’re walking into each other feeling there are complete endless possibilities. Nathalie Virem: Can you explain how five months of meditation practice has impacted your government and Beverly Hills? Lili Bosse: We are now in a society where people are open, willing and wanting to be healthy from the inside out. I really believe that when we are open to ourselves, and when we’re open to each other, each day feels like a positive experience. So I’ve noticed the shift firstly in me. People noticed that too. I’ve always been known to be a very optimistic and welcoming person, but even more so now because I approach the day right away with the sense of calm, peace and gratitude, and we just can’t help but give that to people. You know when you give a smile, when you give a sense of welcoming and “Yes we can do this,” it’s a natural connectedness. With government and working with people and a community, meditation really makes a difference. My handshake is a hug. When I meet somebody for the first time, I don’t shake their hand. Somebody puts out their hand and I say, “I’m a hugger,” and I hug them right away. People automatically feel from the beginning that it’s a positive experience: we can do something together and connect together. I think everything you want to accomplish gets accomplished. A government has never done what we did — over a thousand people meditating in front of the steps of City Hall. Some people thought, “Well… how many people are actually going to come? You’re going to have 20 people, 30 people?” No! It was OVERFLOWING. 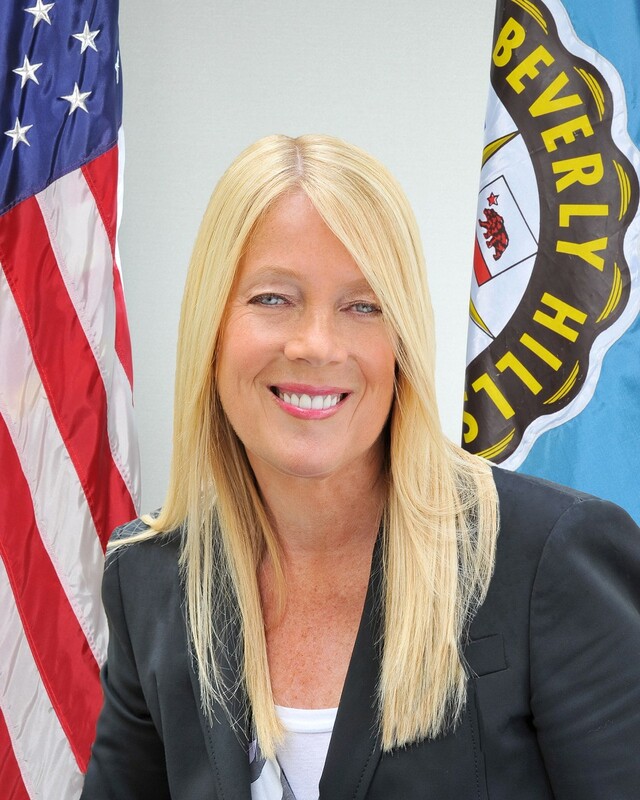 The Honorable Lili Bosse was originally elected to the Beverly Hills City Council in 2011 and is currently serving as mayor. She previously served as mayor in 2014–2015 during the City’s Centennial year. Ms. Bosse has served the community for over 25 years as chair and member of many commissions, committees, foundations and boards, among them the Planning Commission, Traffic and Parking Commission, Fine Art Commission, Beverly Hills Education Foundation, Wilshire Boulevard Temple, Jewish Federation, Aviva Family and Child Services, Hebrew Union College, Synagogue 2000, Wexner Leadership Program, and Visionary Women’s Organization. Her goal has always been to ensure the values of inclusion and diversity, and create a new sense of community in our world class city.